After Promontory: 150 Years of Transcontinental Railroading, prepared by the Center and published by Indiana University Press, is available now for $50 plus shipping. Click for details. View sixty-five color slides including many taken in and around the Center's hometown of Madison, Wisconsin, in the late 1960s. Searching for steam in the 1960s. We have another album from our Fred M. Springer Collection available online. Fred traveled throughout Western Europe in these selections including streetcar no. 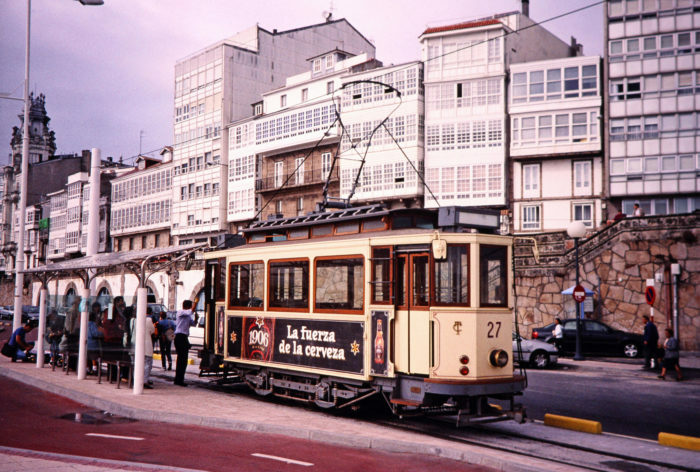 27 picking up passengers in A Coruna, Galicia, Spain, on July 7, 2001. 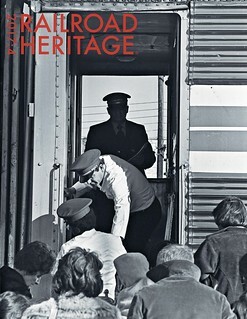 The Center has just added Fred M. Springer selections of Alaska and Canadian Railways. 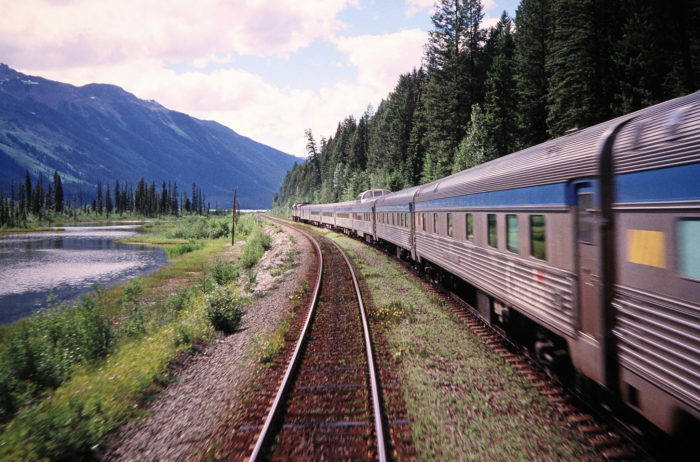 The album includes this moving shot of VIA Rail passenger train no. 1, The Canadian, in the area of Moose Lake in Alberta, Canada, on July 17, 2003. The new Fall 2017 issue of Railroad Heritage is here. Photographer Richard Koenig reflects on “Growing up in Railroad Vacuum” and the value of mentorships with his story and photographs from Indiana and Illinois in the late 1970s. Koenig now teaches art at Michigan’s Kalamazoo College and is working on a project about the original transcontinental railroad. Mark Aldrich, a retired economics professor from Smith College, explores railroad political cartoons from the late 19th and early 20th century in “The Pen is Mightier than the Locomotive.” Jordan Radke, archives manager, offers further insights into copyright concerns surrounding photography and art in his regular “Out of the Archives” column, while Arjan den Boer shares more about European railway poster art in his column. The issue also includes book reviews and a roundup of the Center’s six traveling exhibitions currently on tour. Check out the newest album from Fred M. Springer’s travels. These selections are of Eastern European Railways and feature a scene of Polskie Koleje Państwowe (Polish State Railways) steam locomotive no. 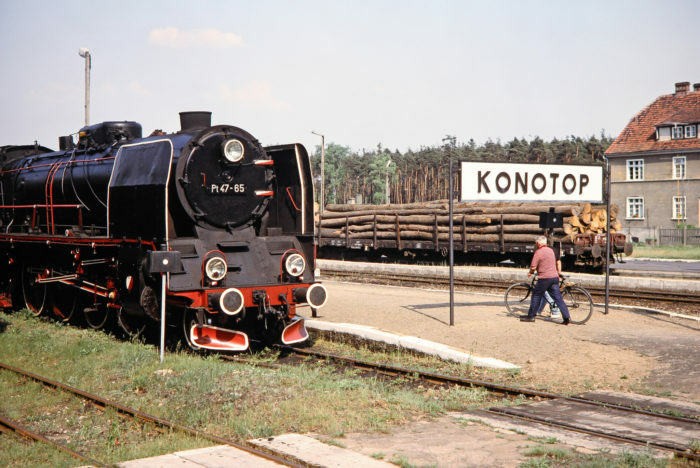 Pt47-65 waiting at Konotop station, as a man walks his bike near the tracks in Konotop, Greater Poland, Poland, on May 20, 1993. The South African Railways album is now online featuring nearly two hundred photographs from our Fred M. Springer Collection. Here, a photographer goes to great lengths to capture the image of South African Railway steam locomotives nos. 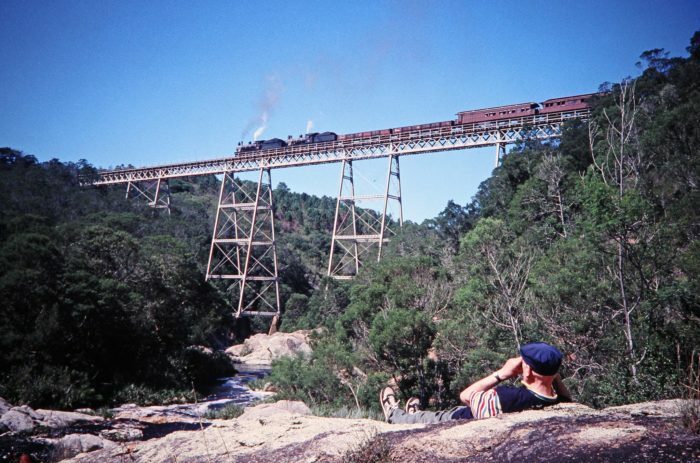 1007 and 1056 crossing the Malgaaten Bridge in Western Cape, South Africa, on March 21, 1995.